Saint-Savin is home to some cafes and an abbey. Founded in 800, it aided in the merging of eastern and western Europe, and in the Christianisation of the region. By the 9th century this abbey had become one of the most important in the region. Situated on the river Creuse, Descartes is steeped in history from it’s 12th century chateau, to the Demarcation line memorial, to the modern sports facilities. The Château de Valençay is located an hour away from Civray overlooking the Nahon valley. Within the renaissance architecture are many pieces of art and hallmarks from when it was a home. In the gardens is the largest recreational maze in France, using clues and riddles doors and gates can be opened. Also, within the garden is a scent game, to name each of the 300 different aromatic plants. The original home of the French language, Tours is located just 1 hour from Civray. It is rich in history and heritage, you can find a cathedral, La Riche, Luynes, Cinq-Mars-la-Pile, Langeais, Chançay, Villandry. Also, if you travel just out of the centre there are opportunities to hire a kayak and paddle down the river. The Château D’Azay-le-Rideau is situated on it’s own island. A mix of 16th century architecture, art and tapestries and 19th century décor allows for a unique visit. It is free to access for all those who are under the age of 26 and are an EU national. A theme park 2 and a half hours away is devoted to history and is a great day out for all the family especially the kids! From the middle ages through the 100 year war to the 18th century there’s many things to see and do, from watching plays, to bird shows, to firework displays. The city of Amboise is home to the Château Royal and the Close Lucé which was home to Leonardo da Vinci in his final years. The Pagoda de Chanteloup built in 1775 sits at a height of 44 meters, from the top a panoramic view of the Loire Valley can be seen. The Forteresse Royal de Chinon has something for all the family, whether it is looking at the armour they have from the 15th century, the rooms dedicated to Joan of Arc, or the interactive app with games and views that bring the middle ages to life. Loches is la cite royale just 30km away, containing gardens, a chateau, several churches plus restaurants (for which we have a guide), or you van view the guide online. The Chateau de Chenonceau has a long history from being first built in the 16th centurary, to being the home of Diane de Poitiers in 1547, then a military hospital from 1914-1918. The demarcation line cut straight through the chateau when it was created in 1939 and they used its location to help many people secretly pass from one side to the other. This chateau has some beautiful gardens and many other attractions. Grand Pressigny is just 8km from Civray. This village features heavily in our local life as it is part of one of our run routes, it is also a nice distance for a leisurely bike ride to visit one of the bars - maybe the Prehisto or Chez L for a cold drink. If you wanted to stay for something to eat Chez L serves lovely pizzas and burgers and Grand'ma serves a traditional French menu. Just 2 hours away from Civray is the city of Bourges, in which you can find a 13th Century cathedral, a garden full of statues and a labyrinth of 1000 gardens. There are also several museums to visit and festivals throughout summer. Azay-le-Ferron is just 23km away from Civray. Situated here is an 18th century chateau which holds many events throughout the year as well as being the home of some extraordinary gardens. There is also a market here on Friday afternoons. The Brenne National Parc spreads over 1,672 km² and contains le mille étangs (1000 lakes) as well as many animals, Châteaux and parks. If the hustle and bustle of sport is not for you, or you want a day exploring this beautiful area there are many sights to be seen, these range from wine routes to Châteaux and cathedrals to bird exhibitions and science museums. There’s lots for the whole family! The tranquility of the area means there are many routes for those who enjoy a stroll or run can take. There is also the 'voie verte' which is a network of disused train tracks, modified to create tracks. 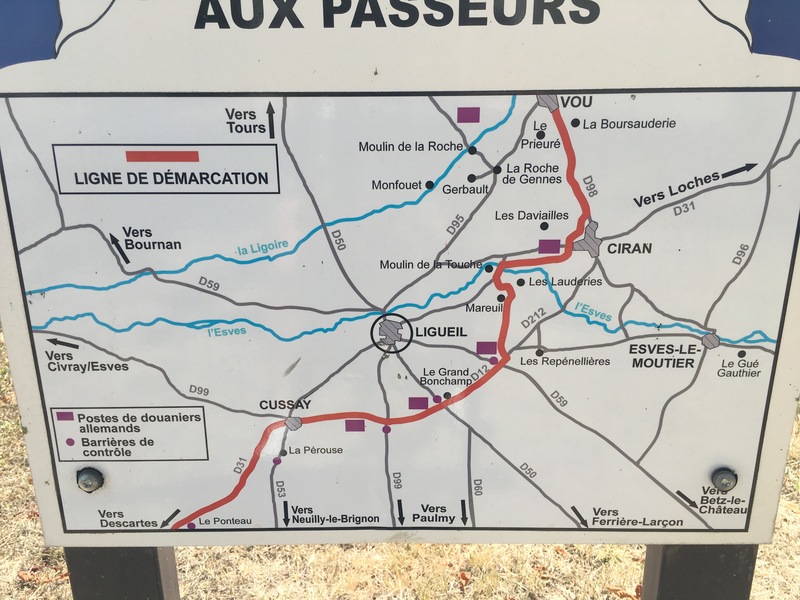 There is a ‘circuit prehistoric’ in the village of Grand-Pressigny which is just up the road, or simply follow one of the routes that we have found! Within the town of Chauvigny, not only is there the standard Marie and church, but there is also the Vélorail - a bike like cart on a disused train track - a museum and birk exhibit! Just a little further is the city Poitiers, here there is a cathedral and Futuroscope! If touring through the area is your thing, there is a Loire Valley wine route, which will take you trough all the vineyards, or just kick back and relax in one of the local vineyards. The Loire River can be followed from Angers through Tours, along the old demarcation line to Blois where there are over 40 châteaux, along with remarkable gardens and museums. The Loire area is steeped in war history, from the demarcation line to historical villages like Oradour-sur-Glane. Just around the corner from Civray part of the old demarcation line from the second world war can be found. This line is marked clearly at the side of the road and again in Descartes where the old barrier can be found. This line marks the difference between German occupied France and free France between 1940 and 1942. Just 2 hours away is the town of Oradour-sur-Glane, this is a village that has been maintained from when it was attacked on June 10th 1944 as a memorial to those who where massacred on this day.